Born in San Diego, California, and raised in Virginia, Eric Skokan studied history at the University of Virginia. After graduation, he moved around the country working in some of the best restaurant kitchens. In 2006, he and his wife, Jill, opened Black Cat Farm Table Bistro in Boulder and followed it a year later with Black Cat Farm. In 2012, he opened Bramble & Hare in Boulder. Both restaurants showcase Eric’s long-held goal of growing and raising most of the food that he serves guests. With nearly 250 varieties of vegetables, grains, legumes and herbs, as well as hundreds of heritage pigs and sheep, Black Cat Farm achieves a true farm-to-table experience for guests. 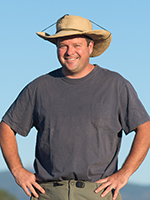 Now, Eric runs the nation’s largest full-scale farm and restaurant group, with the farm achieving both USDA organic and Demeter biodynamic certifications — the only of its kind in the nation. In addition, in 2019 Black Cat kicks-off an energetic farm dinner program, with elegant fine-dining experiences on the farm throughout the growing season. Eric’s hard work and vision earned him a 2017 James Beard Award nomination for Best Chef: Southwest. And his 2014 book, Farm, Fork, Food: A Year of Spectacular Recipes Inspired by Black Cat Farm, was a finalist for a national International Association of Culinary Professionals (IACP) award for Best American Cookbook. Taste undiscovered cheeses and pick up a perfect cup of coffee at Cured and Boxcar Coffee on Pearl Street’s East End. Go to Black Cat Farm to see the animals and pick out fresh veggies. Play a game of racquetball at North Boulder Rec Center or go paddle boarding at the Boulder Reservoir with my wife and kids. Lunch on the lawn at the Boulder Farmer&apos;s Market or at Arabesque. Get inspired by the cookbooks at Peppercorn or at an art gallery, the Carnegie Library for Local History or an event at the Dairy Arts Center. Experience the harvest tasting menu at Black Cat Farm Table Bistro or the comfort and kinship of a delicious casual meal and cocktail at Bramble & Hare.